Gangavaram Beach in Andhra Pradesh ( Visakhapatnam ) - The overhanging rock seen in the picture is one located on the Gangavaram Beach in Visakhapatnam. 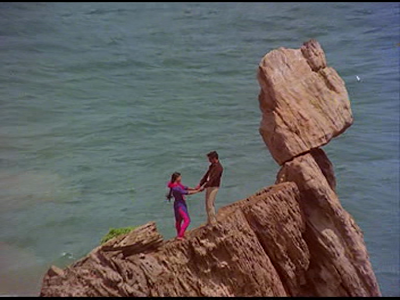 The rock gained popularity in the movie "Ek Duuje Ke Liye". Not to forget Vasu and Sapna's name inscribed on it . . . Notice that extra "U" in Duuje . . . Lyrics none other Anand Bakshi who also won the Filmfare Aware for Best Lyricist for this movie . . .